Its name captures the essence of this remarkable owl. 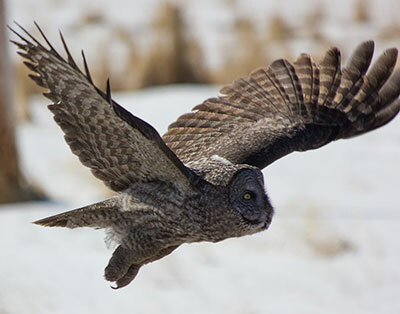 Like the Snowy Owl, highlighted in my last post, the Great Gray Owl is a highly sought subject for wildlife photographers, and it is easy to see why. The disc shaped face and piercing eyes beg to be photographed, not to mention the rather daunting size. The great gray is the largest North American Owl dimension wise, but if you take away the feathers it is actually not that substantial weight-wise. 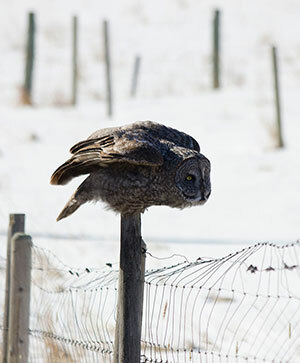 I got a tip from my friend Turbo that there was a patient owl seen on a side road from one of the main Great Gray hotspots North-West of Cochrane, AB. Sure enough, as I rounded the corner, I saw him on the top of a pole. I pulled over, grabbed my camera and carefully crept to the fence post. For a good hour, I got to watch and photograph this magnificent bird hunt. At one point, it landed on a fence post less than 20 feet away from me – it was not bothered by my presence in the least. The image on the left gives a good idea of how close I was. Another photographer pulled up beside me on the road and I wanted to indicate she could join me, but was worried about spooking the owl. So I cautiously tried to wave her over without moving too much. I quickly realized, however, the owl could not have cared less about either of us. So I turned around and told her she was welcome to join me. We stood together in the field for probably 30 minutes and later become ‘friends’ on Flickr. It’s always a pleasure to meet fellow wildlife enthusiasts in the field. This was one of my favorite Great Gray Owl encounters. I was able to capture some of my best portraits, close-ups, behavioral and flight shots ever, at least in my opinion. Nothing beats watching a Great Gray hunt. They glide from their perch towards to ground and sort of hover for a moment before they slam into the grass or snow. They are very elegant. My only complaint about his particular encounter is the sun was on the wrong side most of the time and, although he dove many times, I didn’t actually ever see him capture his prey. Minor in the grand scheme of things of course, and I have captured a Great Gray with a mouse (or vole) before. 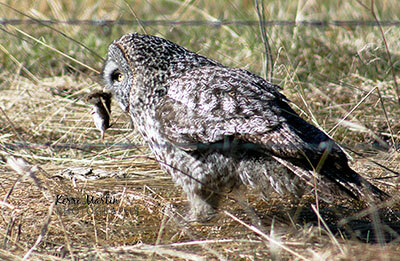 In fact, the very first time I ever saw a Great Gray Owl he had a mouse. It was May of 2012 and I was specifically out looking for the owl. 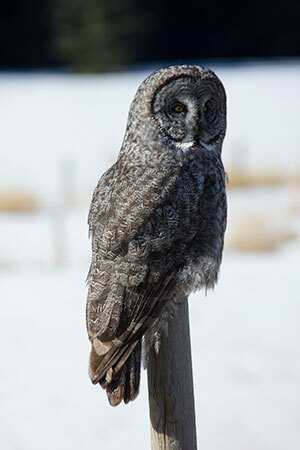 Having heard the area close to Water Valley, AB is a good spot, I had been out several times with no owl luck. But that is the way it goes when you are looking for a specific species – all you can do is gather as much information on where you are most likely to find it, and keep trying until you do. I was near the end of my drive and just happened to glance over to the side of the road, and there he was with a mouse. He immediately flew off to enjoy the meal, leaving me awe struck! 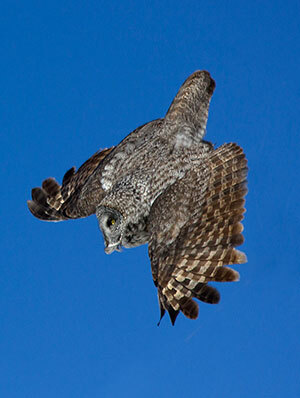 I have been referring to the Great Gray Owls I have seen as ‘he’, but I actually have no idea if that is the case. I’m not aware of any visual markers to tell if a Great Gray is male or female. They just seem to have a masculine energy to me. As mentioned, North West of Cochrane/Water Valley area in Alberta is a great spot for them. They are also often seen in the Sibbald creek area and SW of Calgary. They are fairly common and actually could be seen any where in the mountains or foothills of Alberta. In fact, as I write this now, a Great Gray has been reported within one of Calgary’s nature parks right within the city limits! I am anxious to go check it out so I will bring this post to an end..
Watch for my next post on April 2013: My journey to the Inca Heartland. I’m shifting gears a bit and focusing on my trip to Peru. An addition: Shortly after I finished this post, I went out in search of the Great Gray seen in the city limits and found him. See the images I captured here. Nicely written well “illustrated” entry here! Keep up the great work, I look forward to all of your posts. Great post and imagery Kerri, your love of wildlife certainly comes across in both.